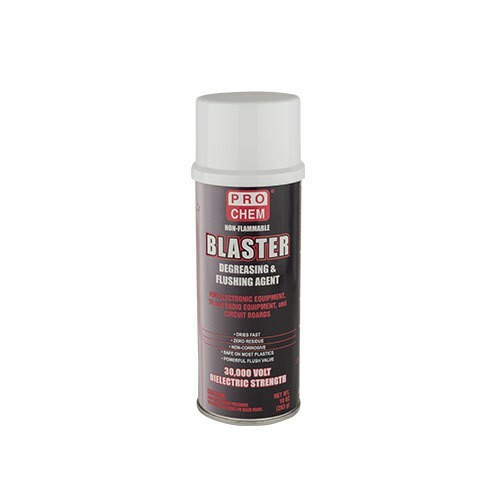 BLASTER | Pro Chem, Inc.
BLASTER is a fast acting, high purity, solvent/degreaser with a strong forceful blast that removes dissolved and loosened dirt, oil, grease, grime, condensate and other contaminants from sophisticated electric parts. It is also excellent for cleaning and degreasing metal parts and fittings. This solvent system has been tested safe on: neoprene, buna, silicone, styrene, polystyrene, butyl and natural rubber, nylon, epoxy, PTFE, polyethylene, polypropylene, ABS, PVC, polyurethane and Hypalon®. For other plastics, test on an inconspicuous spot first.